As I look outside at the frost on my front lawn this morning I thought it would be a great time to discuss fly patterns for Puget Sound sea run cutthroat during the winter. Specifically, the flies we here at South Sound Skiffs use the most during the winter. The available food sources for sea run cutthroat in the south sound can vary greatly during the winter. With herring, sand lance, sculpin, euphosids/krill, polychaete worms, squid, and many other food sources being available for sea run cutthroat to dine on it can be a daunting task trying to figure out what the fish may want at any given time. While you can certainly go as far down the “Match the hatch” rabbit hole as you wish, we are big believers in keeping things as simple as possible. With that in mind we tend to often fish flies that focus more on profile, movement, and to a lesser degree color, rather than trying to match a particular food source down to the last detail. We like flies that are durable, quick to tie, move well, and in many cases can represent several different available food sources. In the freshwater world this would be the equivalent of “attractor patterns”. Whenever possible we prefer to fish these simple patterns, often only changing size and/or color when trying to mimic a particular cutthroat menu item. Without a doubt we catch more fish throughout the year on variations of Clouser Minnows than any other single fly pattern. There is simply not a more productive saltwater fly on the planet. 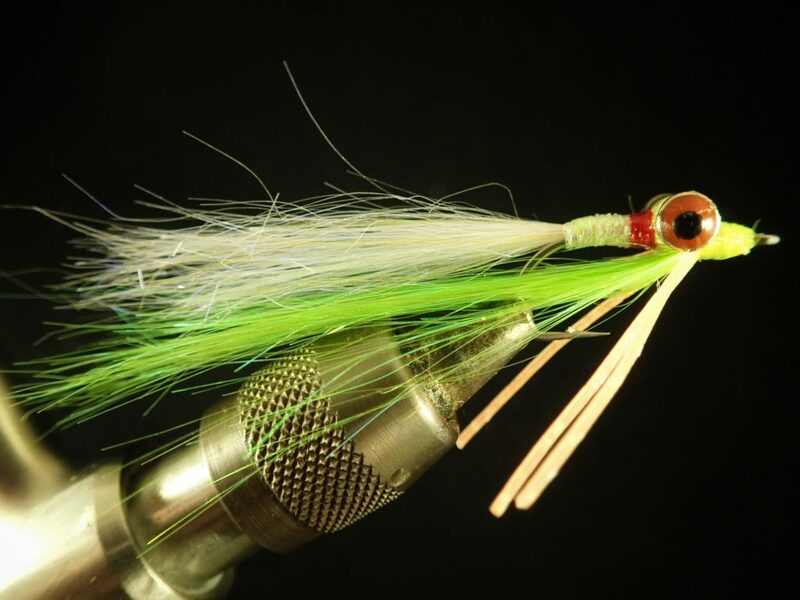 The dumbbell eyeballs give the fly a jigging action that fish just can’t resist, and by changing sizes/colors/materials a Clouser can represent just about any bait fish that swims. They also make a fine sculpin imitation. They are extremely easy to tie, and with a little extra effort and tying material can be tied to be darn near indestructible. Chartreuse and white is our gold standard for all of our saltwater fly fishing here in the Northwest, but olive/white, pink/chartreuse, orange/white, white/white, and many other colors are extremely effective. We keep fly boxes dedicated to nothing but Clouser Minnows. One of our favorite variations, which we’ve nicknamed the “Crazy Clayton”, is simply a rubber legged synthetic Clouser Minnow. It has accounted for an AWFUL lot of fish for us and is year round a fly that will be the first one we tie on. When the cutthroat are feeding on any sort of bait fish during the winter, a Clouser Minnow will nearly always get the job done. 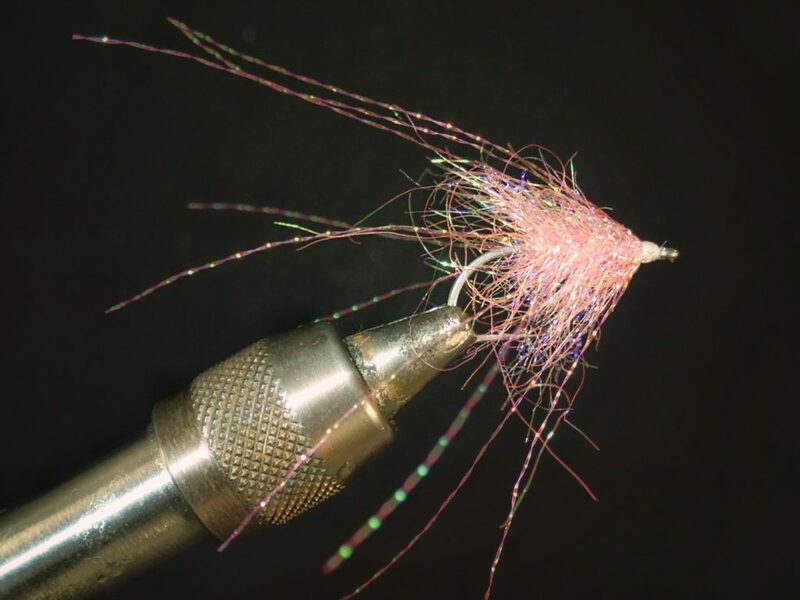 Here’s a vid showing how we tie our Rubber Legged Clousers. 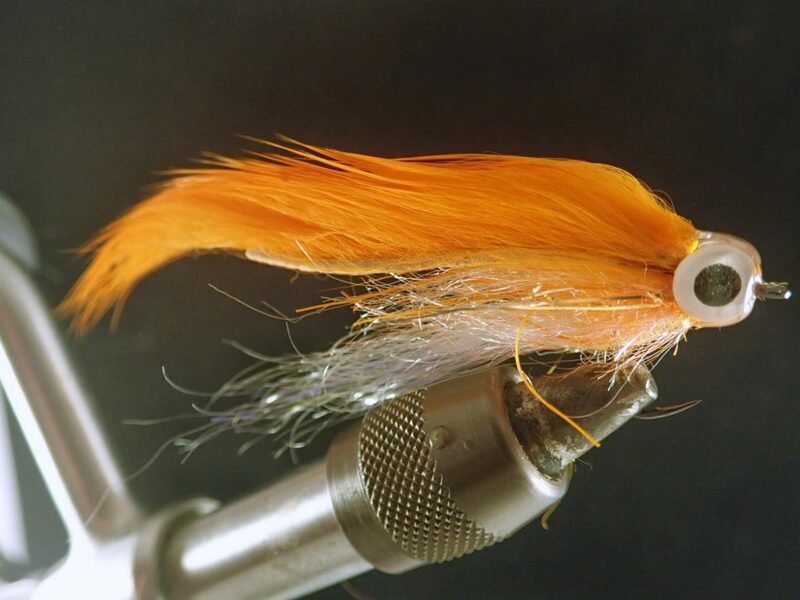 Developed by local sea run cutthroat guru Jeffrey Delia, this simple pattern has accounted for countless sea run cutthroat throughout Puget Sound and Hood Canal. There is no way to know with one hundred percent certainty if the fish think this fly is a squid, or something else entirely, but the combination of the light tan tail with the white body is something most cutthroat just can’t resist. 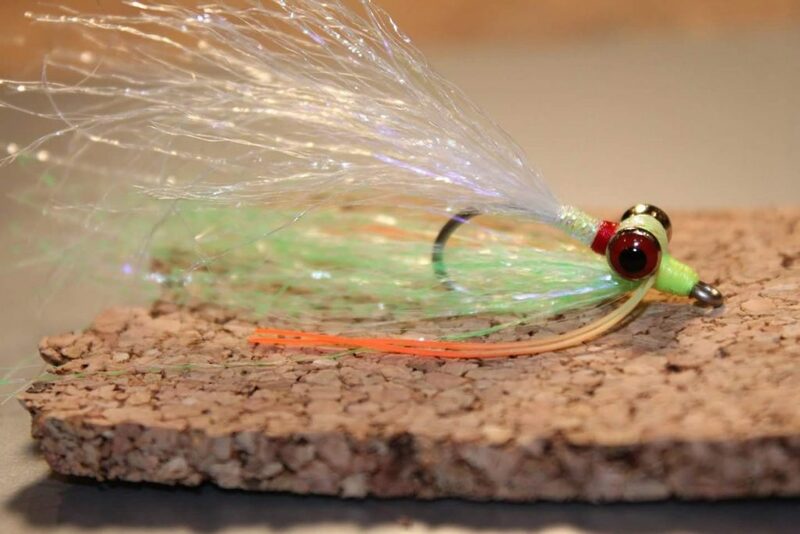 This fly can be tied in just a minute or two, and just flat out catches fish. We find that when fish are sipping euphosids during the winter that a small Delia Squid is often just the ticket for some hot action. 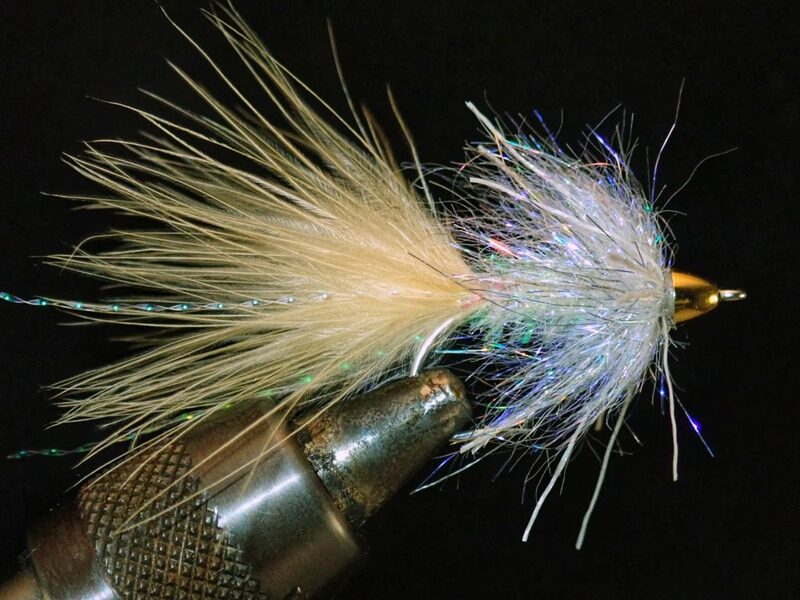 This fly can be tied in many different manners, and with many different materials. The important part seems to be that color combination. We like to experiment with many different variations of this fly, and lately have been tying these using home made dubbing brushes incorporating rubber legs and we are really liking the results thus far. A weightless version dead drifted with a long leader has produced extremely well on days when nothing else would. Here’s a vid showing how we tie our basic Delia Squids. We will be posting a new vid soon showing how to tie the dubbing brush version. The Squimp is a fantastic for Puget Sound in the winter. It’s also fantastic every other time of the year. This is just a fish catching fly. This fly kind of has a little of everything going for it. 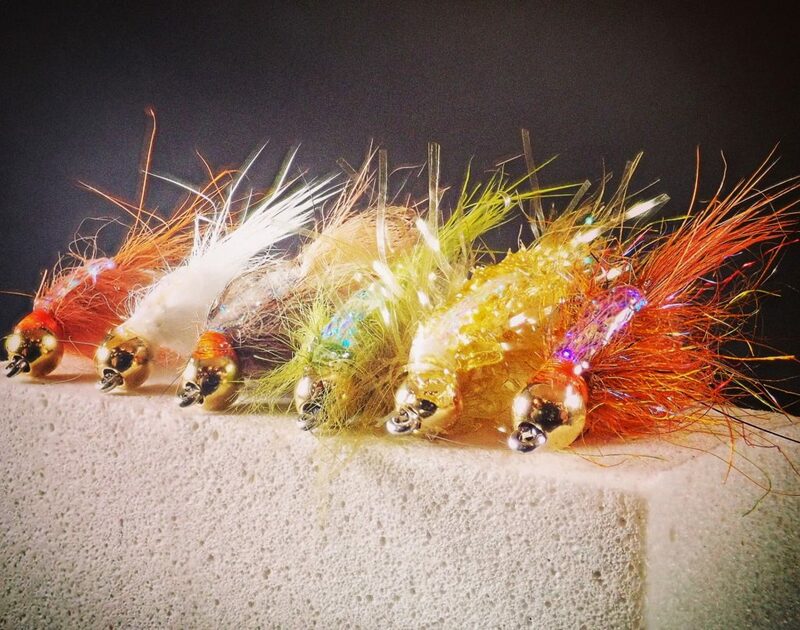 It has great movement with the marabou tail and and various collar materials, the Golden Pheasant Tippets give the fly a wonderful barred/shrimpy look, when tied with different materials at the collar it gives it some squid like features, and the color really stands out and seems to be a magnet for fish. 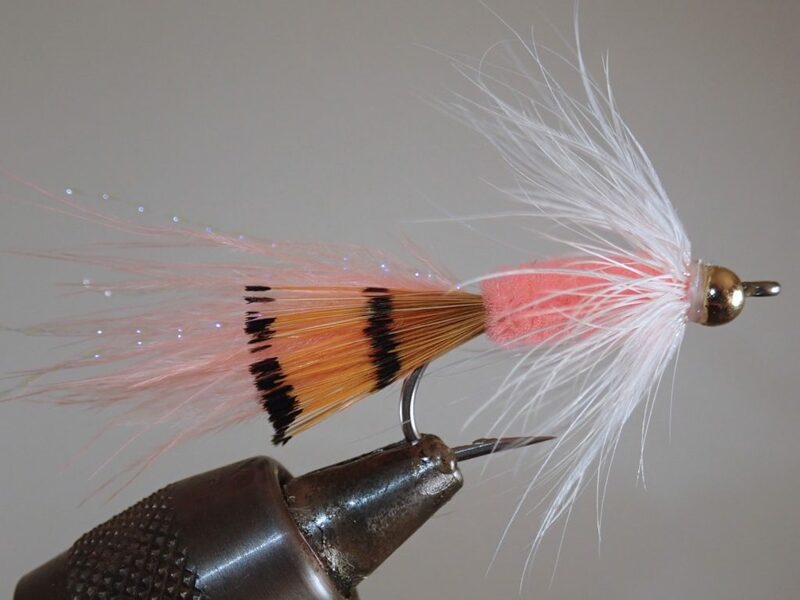 This fly was developed by a fantastic local fly tier and beach angler Mark Mercer, and is one that can be tied using a variety of materials. Similar to the squid variation above, we’ve been tying this one using home spun dubbing brushes a lot lately with great results. Here’s a video for how we tie a Squimp. I have no idea why our cutthroat love the color orange so much, but they just do. We would never even consider leaving the dock without having some orange flies in our box. Orange over white Clousers are often a huge producer, and we almost always incorporate orange into our sculpin patterns. Orange is our most used color for euphosid/shrimp/amphipod type patterns, and when nothing else is producing a switch to orange is often all it takes find some action. This little orange bunny strip pattern has become a real favorite lately. Easy to tie, and fish have been responding to it extremely well this winter. Tied on an Ahrex NS172 Curved Gammarus hook, we’ve been extremely pleased with how well this fly has produced. As much as we love fishing larger streamer style patterns there are times during the winter when the fish get extremely keyed in on krill/euphosids, amphipods and small crustaceans. These times can be frustrating because the fish can become pretty selective, and there are times we are pulling our hair out casting fly after fly to fish that are obviously feeding, only to be ignored. It’s a good idea to have a selection of smaller flies on hand for these situations. As mentioned above a down sized Delia Squid is often our most productive fly in these situations, but we do tie and fish small scud style patterns and a variety of small shrimp flies. We are constantly attempting to find the perfect fly for these scenarios. 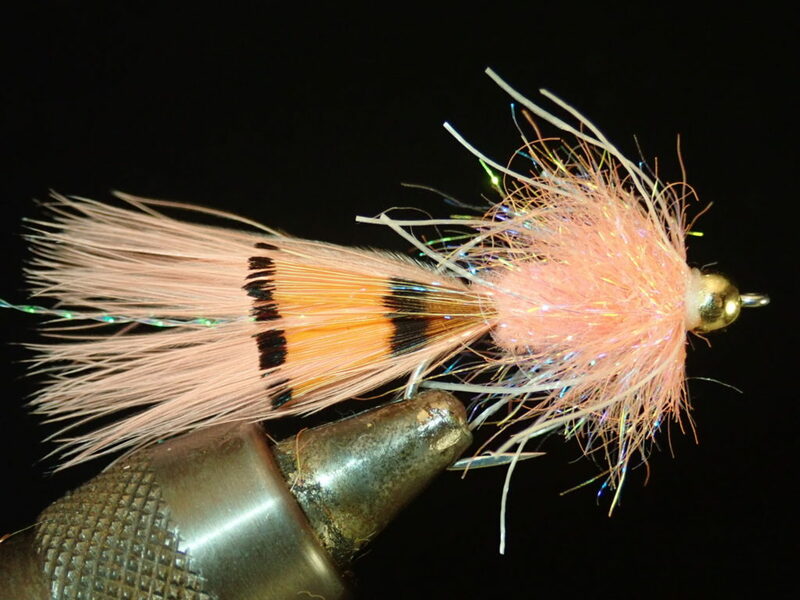 Most of the flies we tie for this tend to be white, orange, pink, or some combination thereof. Here is a fly we’ve just recently started playing around with. Inspired by a SW WA fly tier, this krill-ish pattern looks like it has potential to be a big hit with our sea run cutthroat and we are excited to see how the fish respond. These are just the flies that we have been fishing the most often this winter, but certainly not the only flies we fish. Sculpins, worms, various bait fish patterns and plenty more are staples of our Puget Sound fly boxes. These are just the flies that we find ourselves fishing the most often during the winter, especially this year. 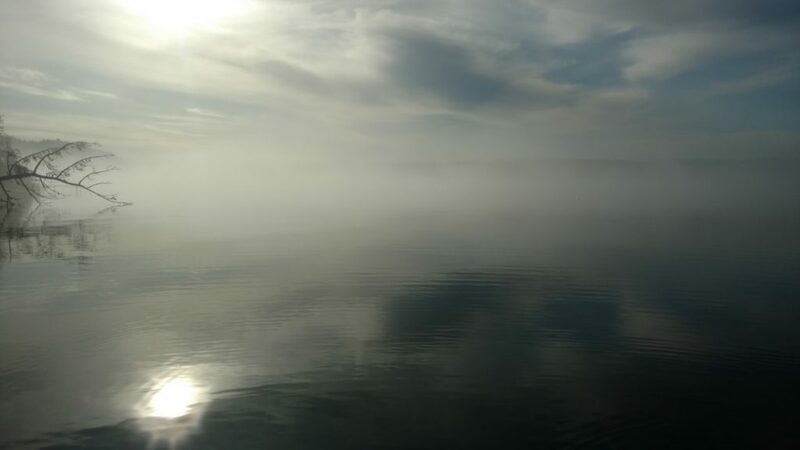 So bundle up and get out there on the water. While often cold, the winter provides some incredible fly fishing here in Puget Sound. 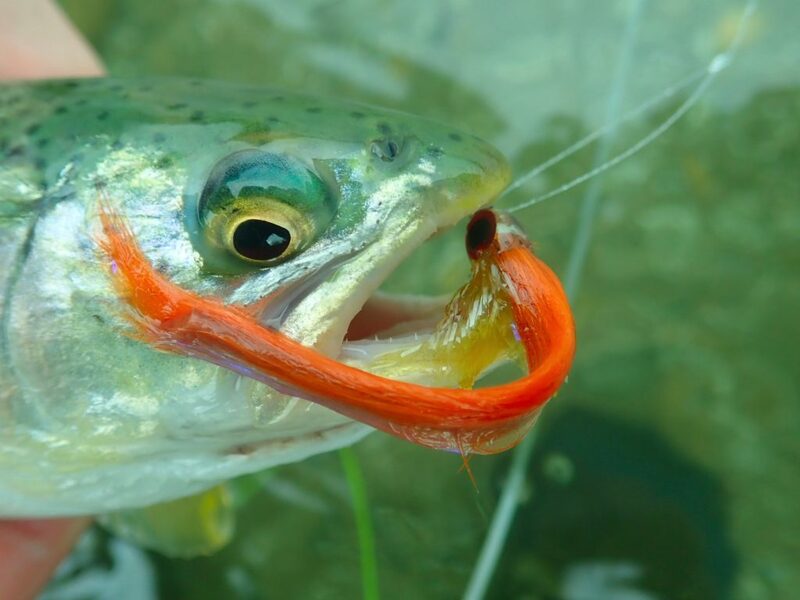 We find that these flies will produce great sea run cutthroat fishing throughout most of the winter, and hopefully you may have some success with them as well!